March 14 is Pi Day, the geekiest holiday of the year. And the official food of Pi Day is (you guessed it) PIE. Cheated on this one a bit by buying Pillsbury pie crusts (the kind you unroll and use however you want, not the pre-formed kind), but made the filling from scratch with a mix of fresh granny smith apples and red anjou pears, some of my homemade applesauce from last fall, brown sugar, cinnamon, and a bit of ginger and clove. Baked according to the instructions in my William-Sonoma Essentials of Baking book, it came out perfectly golden brown and bubbly (as you can see). Was reportedly delicious, though I didn’t have any myself – my coworkers demolished it before I could get myself a slice. I was going for simple on this one because I was trying to watch the Rangers win a road game at the same time, and I knew I’d just be bringing it into work the next day. 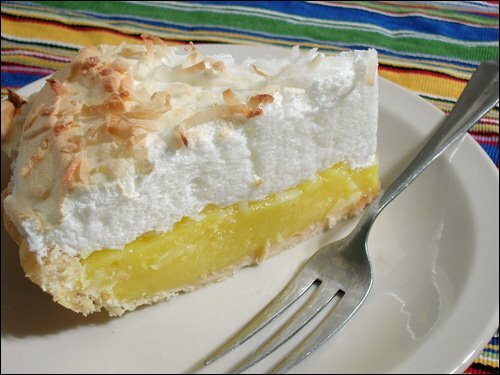 However, J still wants pie, and frankly so do I, and so I’m thinking of challenging myself a bit later to make a lemon coconut meringue pie for our own Pi Day celebration. Guess we’ll see how that goes – I’ll update this post with Pi Day pie number two should it come out well. 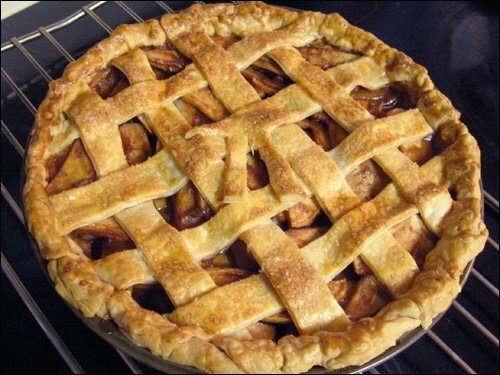 Have you ever made pie for Pi Day? This entry was posted in Food, Drinks and Cooking, Table for Two? Archives and tagged baking, desserts, random. Bookmark the permalink.